I bought it from AD in Vienna for 2800 euro. This was the lowest AD price I found since vast majority of ADs are not willing to go under 10% discount from retail. garydusa, montrealer, Phil_P and 1 others like this. 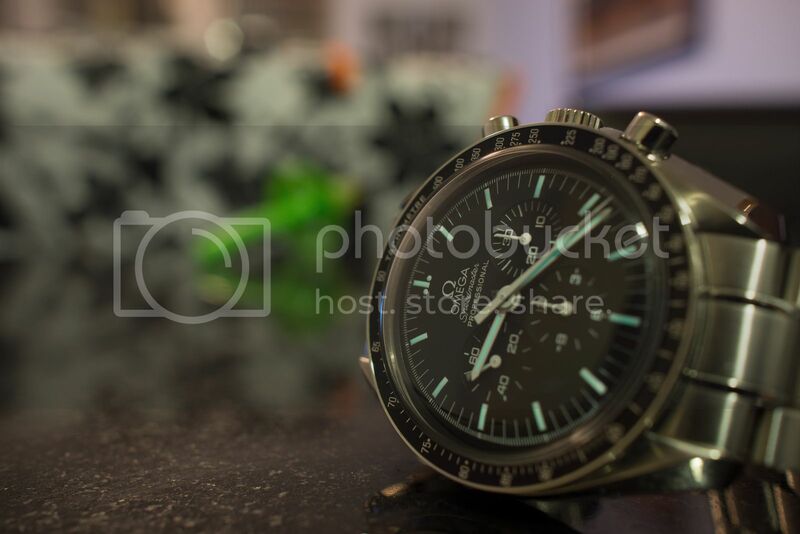 I picked up a brand new Speedmaster Professional 3570.50 (sn 777721xx) a few weeks ago from an AD and have been loving it ever since. During my first day back to work with it (airline pilot), I reached behind my seat for the logbook and felt my watch touch the back of the seat... two deep scratches to the face of the hesalite crystal. I was disappointed to say the least. On to the WUS forum and found a very helpful and descriptive post by WUS member 'jean-michel' on how to resolve this issue. I found polyWatch in Portland OR and with about 7 minutes of polishing, the two fairly deep scratches were taken right out. Go slow and be patient. I couldn't believe the difference; my watch looks brand new again. I couldn't be more happy with the results and would suggest it to anybody looking to clean up their hesalite crystal. I wish I had before and after pictures! Little did I know that polyWatch actually comes with a polishing cloth in the package - would have saved me a trip around town for microfiber and 1000 grit sandpaper that I didn't need either of... for next time! Last edited by dash8311; March 9th, 2013 at 01:00.
garydusa, megamustang, Spacefruit and 1 others like this. though the hesalite is easier to scratch the fact that it is so easy to repair gives me peace of mind. The hesalite was at first one of the reasons I was not sure I wanted the watch, now it is one of the main reasons why I love it, from both an aesthetic and utilitarian perspective. dash8311 and garydusa like this. First time Omega owner and my first high end watch. 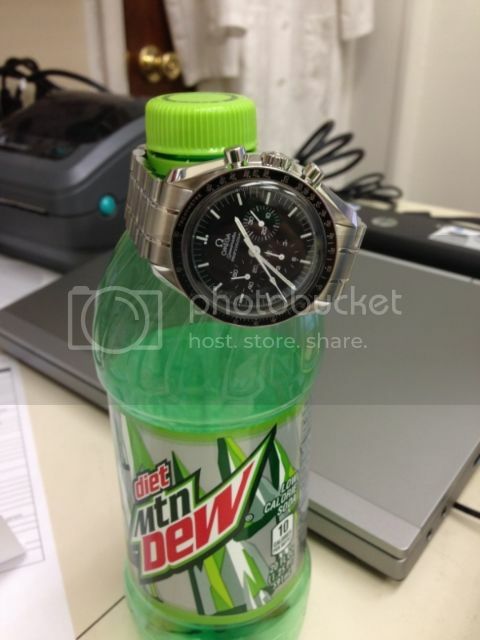 I have had many other mid and lower end watches, but nothing like this. I got my 3750.50 off the bay from a reputable dealer it came in the mail on Monday, but it needed extra links to fit my 7.5" wrist. I had to wait till Thursday for the extra links for my 1998/840 bracelet to come in from Ofrei. So it's now finally on my wrist. It's everything I'd hoped it would be- a classic piece of history I can wear. There's a 1/8th scratch at 12 that I knew about when I bought the watch, but it's nothing a little pollywatch can't fix. 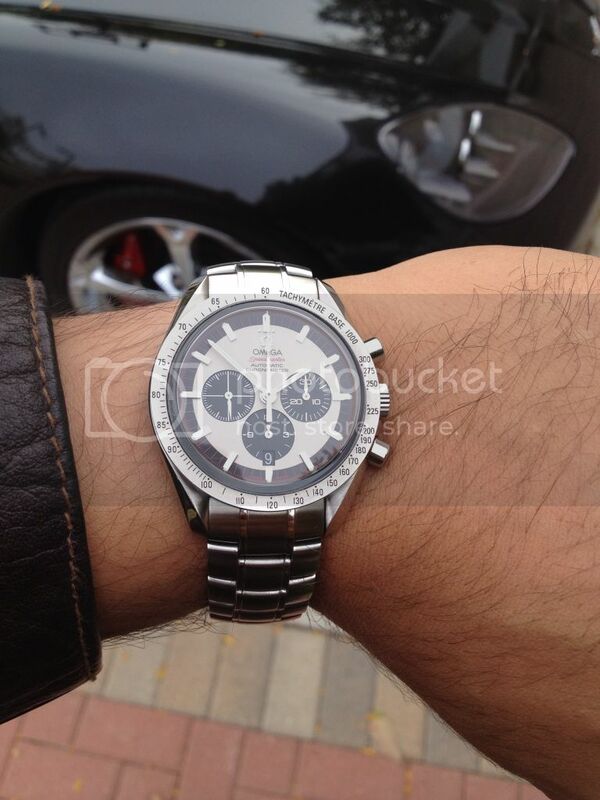 Here's my first wrist shot with it. dash8311, garydusa and mitadoc like this. 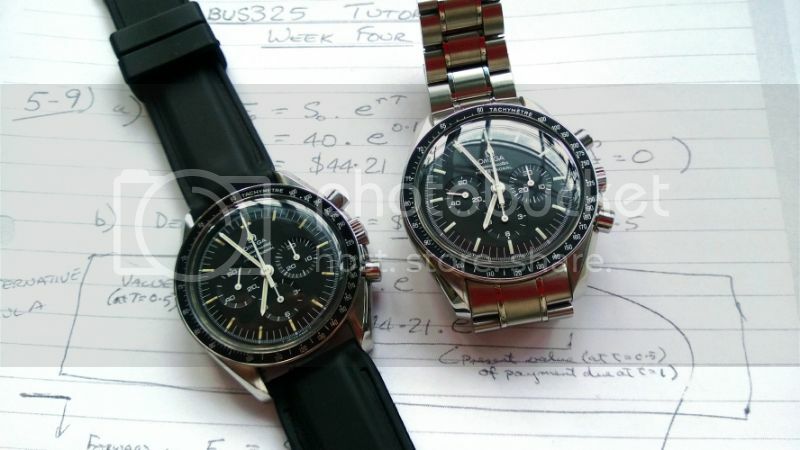 I added another speedmaster into the collection today. The ST145.022 , while there is hardly any difference from the 3570.50, I feel in love with that aged tritium dial. Last edited by mew88; March 9th, 2013 at 17:24.
garydusa, CCJ and flyinghell34 like this. Mines back from a service running like a champ! garydusa, megamustang, Spiki and 1 others like this. Ooh! I wanna play! My Michael Schumacher Edition 2006. I love this watch because it reminds me of my favorite Paul Newman Daytona. Fullers1845, Dimer, mitadoc and 3 others like this. Its only the third day with my pre-loved speedy. Can I join?